These are more general resources for biodiversity education. The first group is mainly for Washington state while the latter is applicable to a wider audience. 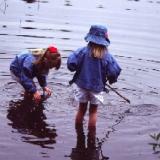 This 2004 report card, prepared at the request of the Washington State Legislature, summarizes the status of environmental education in Washington. The Environmental Literacy Council is an independent, non-profit organization dedicated to helping citizens, especially young people, participate wisely in the environmental arena. The Council gives teachers the tools to help students develop environmental literacy: a fundamental understanding of the systems of the world, both living and non-living, along with the analytical skills needed to weigh scientific evidence and policy choices. See their section on biodiversity. Chartered by Congress in 1990, The National Environmental Education & Training Foundation (NEETF) is a private non-profit organization dedicated to advancing environmental education in its many forms. Its mission is to build a stronger future through environmental learning, with improved health, education, business, and ecological protection through innovative environmental learning. In 2005 they issued a report, Environmental Literacy in America. With over 10,000 members world wide, the Society for Conservation Biology is an international professional organization dedicated to promoting the scientific study of the phenomena that affect the maintenance, loss, and restoration of biological diversity. They have developed an extensive list of web pages to provide students, educators, and members of the public ready access to information and resources for conservation education. This digest(pdf document) of information from the Education Resources Information Center (ERIC) was published in 1998. It includes how biodiversity education fits into national science education standards as well as a list of research and resources. The Tree of Life Web Project (ToL) is a collaborative effort of biologists from around the world. On more than 4000 webpages, the project provides information about the diversity of organisms on Earth, their evolutionary history (phylogeny), and characteristics. Teachers, learners, and science enthusiasts are invited to explore Life on Earth and share their learning.